It is a pleasure to host people from all over the world at Ellas Vacation Rentals. I’m Ella, a small-town girl currently living in southwestern Florida. I grew up in the Caucasus Mountains, in one of the former Soviet republics. I left home at the early age of 15 with an enormous urge to travel. My humble fate brought me to California, where shortly after my arrival I received a full academic scholarship to UCLA, from which I graduated with honors. In my free time from studying, I worked as a model, and was on TV shows like Bay Watch and Beverly Hills 90210. I made California my base for the next 20 years and continued to travel the world. English is my seventh language. My extensive travelling taught me to see the beauty in the world around me. I learned when I was very young that what makes a woman beautiful is her attitude towards the world. Life is short and running fast, so I try to appreciate every day, accomplish as much as possible, and be kind to everyone I meet. I love humanity. I started EllasVacationRentals.com blog to share my travel adventures with people around the planet, and to help them make the most of their travels. I don’t just want to take up space on this earth, I want to make a positive difference in as many ways as I can. I hope that my travel blog inspires people to explore, get out of their comfort zones and away from the rat race, to escape, to enjoy the beauty in the world, and to believe that anything is possible. TRAVEL. LAUGHT. DISCOVER. LOVE. BELIEVE. Moscow, Russia; Alushta and Kiev, Ukraine; Tbilisi, Georgia; . . . St. Lawrence Gap, Barbados; St. Maarten, St. Martin; . . . and many more.
. . . I took a couple of road trips across the U.S., during one of which I was going from Los Angeles to New York City and spent 38 hours in a Porsche. For five of those hours I was stuck in LA traffic, trying to get out of the city on a Friday night. I consider myself a professional traveler. Different countries, languages and cultures have added rich diversity to my life. When I travel, I’m like a fish in the ocean. My intent is to make your stay at Ella’s Vacation Rentals the best of your life. I welcome my guests to connect with me via my LINKEDIN page. I am always looking forward to establishing new connections. 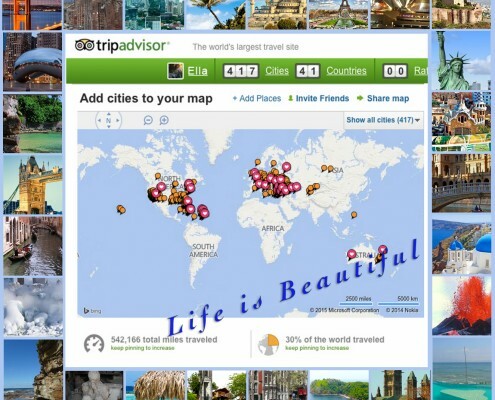 According to TripAdvisor, I have been to 41 countries, at least 417 cities, and have visited about 30% of the world, some 542,166 miles. Honestly, I gave up counting.